A tribute to our Normandy vets, and a history lesson for our youth. On this anniversary of the D-Day invasion, we would be wise to remember the sacrifices and hardships our veterans endured to liberate a continent. Through their eyes, we see the true character of America and the price of freedom. The French certainly haven’t forgotten, nor should we. Codenamed “Operation Overlord,” the Allied invasion of Europe via Normandy, France was conducted 70 years ago today. Most of the veterans of the largest amphibious invasion of all time have since passed, but we should be mindful of their achievement and the sacrifices they bore. It was their job to cross the English Channel and breach Hitler’s formidable Atlantic Wall, laced with a million land mines, booby traps, anti-tank traps, miles of barbed wire, battle hardened troops, and concealed fortifications with heavy armament. The Germans were commanded by Field Marshal Erwin Rommel, the legendary “Desert Fox” from the North African campaign. As such, the Allies recognized this would be a daunting task. The Supreme Allied Commander was General Dwight Eisenhower, better known as “Ike.” It was his job to plan, organize and implement this massive invasion. Devising a suitable strategy would prove difficult. The conventional wisdom at the time assumed the Allies would invade at Pas de Calais, representing the shortest distance between England and France. Not surprising, this area was heavily fortified by the Germans in anticipation of the crossing there. Realizing the considerable number of soldiers and equipment needed to make the invasion a success, Eisenhower needed to rely on the element of surprise. Consequently, Normandy was selected. In addition to the strategy, the job was made complicated by the number of Allied countries involved, the number of personnel and equipment required, the weather and lunar cycle, which dictated the tides, and some slight of hand to keep the Germans off balance. To this end, Eisenhower devised an entire phantom army around General George S. Patton, using decoys, props, and fake signals. The charade caused the Germans to believe Patton would lead the invasion at Pas de Calais. The politics and logistics of assembling the invasion under tight secrecy was incredible, and a tribute to Eisenhower’s determination, organizational skills, and political finesse. Ike hinted at his approach by saying, “Leadership is the art of getting someone else to do something you want done because he wants to do it.” In reality, Eisenhower had to walk a fine line not to offend any of the Allies involved with the invasion. This included not showing favoritism to the Americans and belittling the British. As a result, overall command of the ground forces was given to Britain’s Field Marshal Bernard Montgomery. Utah Beach – represented the right flank, the most western side of the attack. The US 4th Infantry Division met light resistance there. Omaha Beach – was the most heavily defended and where Allies suffered the most casualties. Here, the untested US 29th Infantry Division was joined by the veteran 1st Infantry Division (The Big Red One). Gold Beach – was charged to the British 50th (Northumbrian) Infantry Division. Juno Beach – was charged to the Canadian 3rd Infantry Division and commandos of the Royal Marines. Sword Beach – was located closest to the town of Caen. It was charged to the British 3rd Infantry Division who met armored resistance from the 21st Panzer Division. Pointe du Hoc – was the highest point between Utah and Omaha Beaches and heavily fortified by the Germans. US Army Rangers scaled the cliffs and overcame the Germans. Just prior to the invasion, thousands of Allied airborne troops invaded behind the lines at Normandy under the cover of darkness. Their mission was to secure bridges and strategic locations until relieved by troops coming from the beaches. At the town of Sainte-Mère-Église, American paratroopers suffered heavy casualties as they descended on the town, thanks in large part to a building on fire and illuminating the night sky, making the soldiers easy targets. Many other paratroopers fell into fields deliberately flooded by the Germans. Burdened by considerable equipment, many Allied soldiers drowned. Eisenhower’s attack caught the Germans by surprise, including Hitler and Rommel, causing them to react slowly. Nonetheless, 12,000 Allied casualties were recorded on the first day, with 4,414 confirmed dead, and several others missing. The Germans would lose 1,000 men, small by comparison. Although the Germans were finally able to mount a counterattack, the Allies had secured Normandy and began to move inland. Two months later, they would liberate Paris. Eleven months later, the war in Europe would be over. “When my part of the Division landed, there were impressions made on my mind that will never leave it. Just before landing we could see heavy artillery shells bursting all up and down the beach at the water’s edge under well directed fire. As I stood in line waiting to get off the LCI to a smaller craft to go into shore, I was looking toward land and saw a large shell fall right on a landing craft full of men. I had been praying quite a bit through the night as we approached the French coast but now I began praying more earnestly than ever. Danger was everywhere; death was not far off. I knew that God alone is the maker and preserver of life, who loves to hear and answer prayer. We finally landed and our assault craft was miraculously spared, for we landed with no shells hitting our boat. Chaplain Burkhalter would go on to receive the Bronze Star for valor, the Silver Star for gallantry, and the Purple Heart for injuries sustained. His full letter was published in the Miami Daily News on Sunday, August 6, 1944. 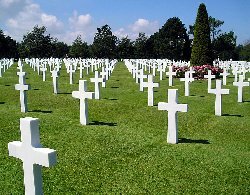 Many memorials have been erected to commemorate World War II, but the Normandy American Cemetery and Memorial has particular significance for D-Day veterans as it represents the final resting place of 9,387 Americans who perished at Normandy, and 307 graves are marked unknown. Another 1,557 names are inscribed on a wall there who lost their lives but could not be located or identified. And that’s just the point, the lesson taught by the veterans of D-Day, and all the other veterans who fought for our country is simple, Freedom is not free. It has to be paid for by the sweat and blood of those willing to fight and protect it. We must be mindful of their sacrifice well after the last Normandy veteran has passed. Let us hope future generations will be able to rise to the occasion when called upon, just as the D-Day vets did. Congratulations veterans and Thank You. For more information on D-Day, see the National WW2 Museum. The stories of the liberation of France is incredibly moving. We didn’t know about the massacre of Canadian soldiers at the Abbey Ardenne after D-Day in Normandy until recently. It is not a dramatic place to visit but an emotional experience to see the memorial in the tiny garden where they died.